By any name, the damage they wreak is the same. My first run-in with hornworms was with their frass (droppings). 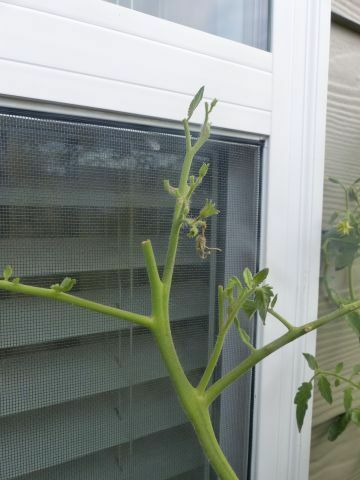 I noticed that the leaves on my tomato plants had little pinholes in them accompanied by what looked like little black bugs. I still don’t know what caused the pinholes, but the “little black bugs” were hornworm frass. A more obvious sign was that the leaves at the tops of my plants had been stripped, leaving only the petiole (the stalk that joins the leaf to the stem). The worms will also munch on fruit, shearing off one side of the vegetable, leaving a large open scar. They feed only on solanaceous plants, i.e. the nightshade family. They specialize in tomatoes and tobacco, but also favor eggplants, potatoes, peppers, and jimsonweed. Hornworms are notoriously hard to spot. They favor the (hairy) underside of plant stems and are themselves green with slightly hairy legs. They also shy away from daylight, hiding deep in the foliage to ecsape the direct sun during the day while doing their damage before sunrise and after sunset. And the tiniest are almost impossible to find. At maturity hornworms can be four inches long and can eat several leaves and even a fruit in one day. Although hornworms seemingly arrive spontaneously, they may, in fact, have over-wintered as pupae (the non-feeding stage where the caterpillar larva changes to an adult) in your garden, particularly if you didn’t rotate your crops or till your soil before and after harvest. 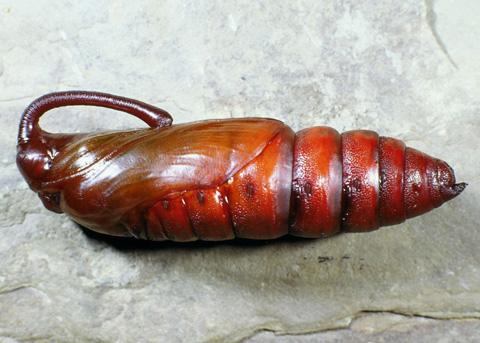 Pupae are large, elongate-oval, with a hard, reddish brown case about two inches long, pointed at the posterior end, with a distinctive loop attached at the front and extending ¼ to 1/3 the length of the body. (insert pupae photo). Moths (commonly referred to as hawk, sphinx, or hummingbird moths) emerge from the pupae in the spring. 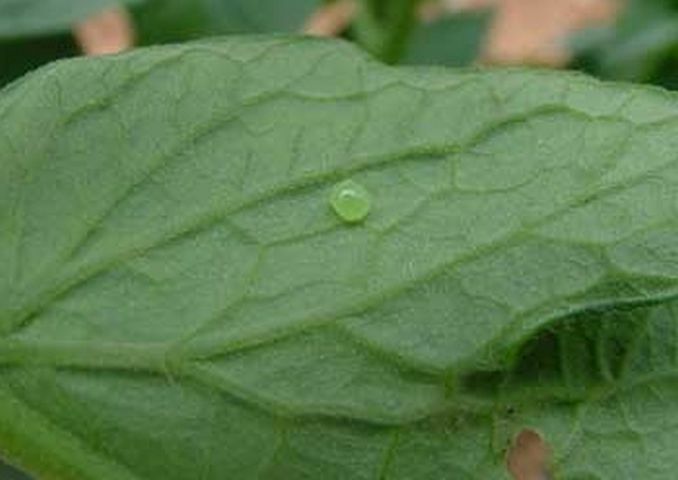 After mating, females deposit smooth, 1/16”, light green eggs on leaf surfaces (usually the underside, rarely the top). Depending on temperature, the hornworms emerge from the eggs in approximately four days. The eggs turn white before they hatch. Hornworms begin to emerge in early June and may continue to emerge throughout the remainder of the growing season. Once the caterpillars hatch, they begin eating immediately and are fully grown in three to four weeks. The mature caterpillars drop off plants, burrow into the soil to pupate, and some three weeks later, create an additional wave of pests, the pupae of which will overwinter in the soil. The hornworm moth may also find your plant by smell, deposit her eggs, and create the cycle. Each moth deposits one to five eggs per visit. In her short lifespan, a female can lay up to 2,000 eggs. Prevention is the best medicine: rotate your crops; till your soil before and after planting, keeping an eye out for pupae. Be vigilant. Be alert for large, gray-brown moths with a 4 -5 inch wingspan, and font wings much longer than back wings. The wings have dark and white uneven bands. Moths are most active at sunset and just before dawn feeding on nectar from flowers. So that hummingbird you think you see, may not be! Hand pick the hornworms. Search under chewed leaves and above frass-covered leaves. Spraying water on plants agitates the hornworms making them easier to spot. Crush or drown in soapy water. Let nature take its course, then help it along. Hornworms are often parasitized by Braconid wasps which burrow into them to lay eggs. 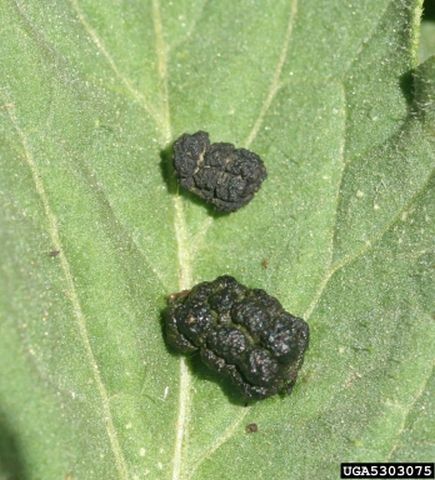 The cocoons of the Braconid wasps look like grains of rice attached to the hornworm’s back. Eventually the wasps will fly through the cocoon and parasitize another hornworm. 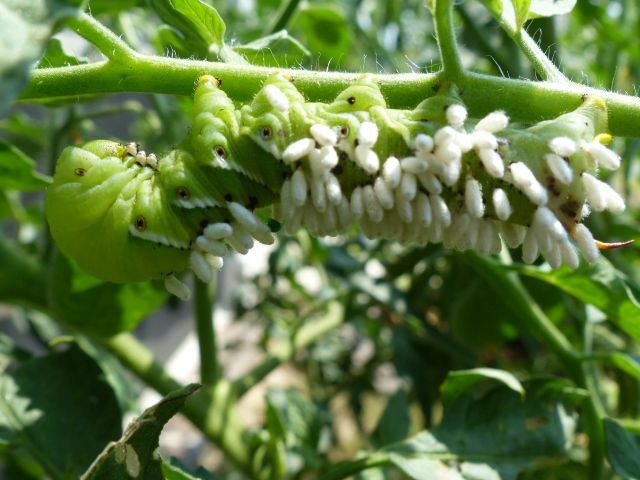 Parasitized hornworms stop eating and eventually die. To help Mother Nature even further, clip the host leaf with the parasitized hornworm, place it in a glass jar, and cover the glass jar with a screen so the hornworm can’t escape, but the newly hatched wasps can fly through the netting. Leave the jar in the tomato patch.